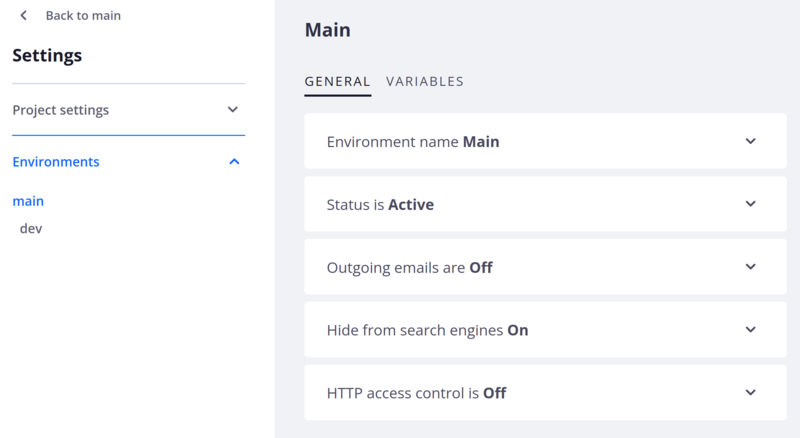 You can access an environment&apos;s settings by selecting that environment from the Select Environments pull-down menu at the top of the page or by clicking that environment within the Environments graphic on the right side. Click the Settings tab at the top of the screen. The General screen allows you to extend the behavior of a specific environment. The first setting allows you to modify the name of the environment and view its parent environment. From the Status tab, you can activate or delete an environment. The Delete action will destroy all services running on this environment (PHP, MySQL, volumes, etc.) so that only the Git branch remains. You can reactivate the environment later if needed. note Deleting the Master environment is forbidden. 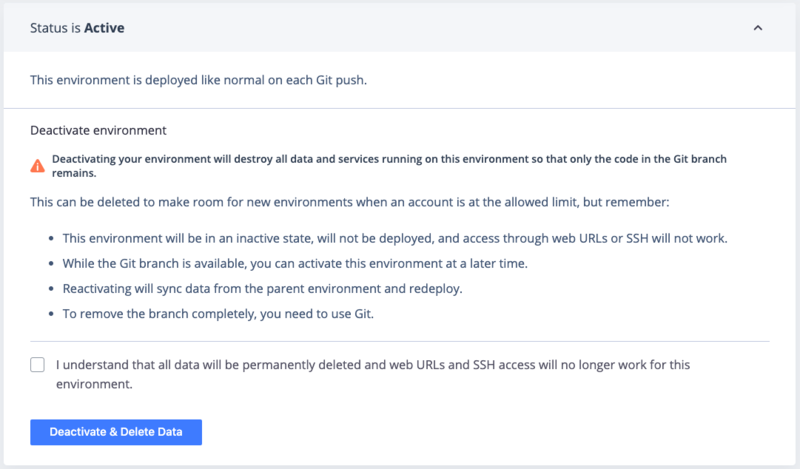 From this tab, you can allow your application to send emails via a SendGrid SMTP proxy. Changing this setting will temporarily list the environment&apos;s status as "Building", as the project re-builds with the new setting. Once it has re-deployed, it will appear once again as "Active" in your settings. From this tab, you can tell search engines to ignore the site entirely, even if it is publicly visible. where ENVNAME is the name of the environment. On a production instance (the master branch, after a domain has been assigned) the search-blocker is disabled and your application can serve a robots.txt file as normal. However, you must ensure that the file is in your project&apos;s web root (the directory where the / location maps to) and your application is configured to serve it. See the location section in .platform.app.yaml. You should not expose your development environments to the whole wide world. 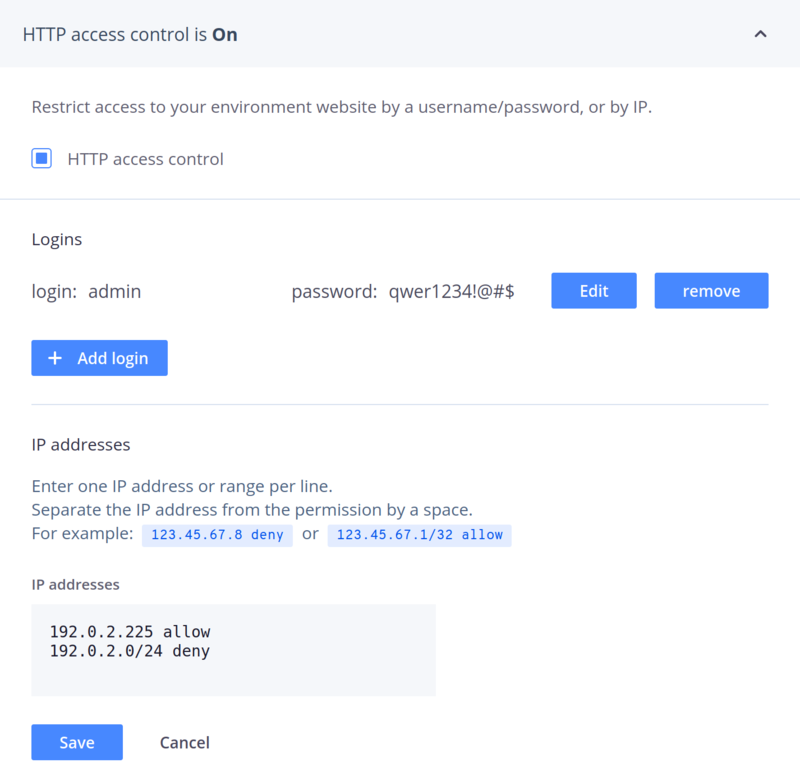 Platform.sh allows you to simply implement access control, either by login/password (the equivalent to .htaccess) or by filtering IP addresses or a network using the CIDR format. That is, 4.5.6.7 and 4.5.6.0/8 are both legal formats. note Changing access control will trigger a new deploy of the current environment. However, the changes will not propagate to child environments until they are manually redeployed. These settings get inherited by branches below the one you are on. That means if you create a staging environment, and you create branches from this one, they will all inherit the same authentication information and you only have to set-it up once. You can also setup authentication with the CLI using the following command platform environment:http-access which also allows you to read the current setup. This eases the integration of CI jobs with Platform.sh as you will not need to hardcode the values in the CI. You can allow or deny access to specific IPs or IP ranges. First switch the access control section to ON. Then add one or more IPs or CIDR IP masks, followed by allow or deny. See the example below. Note that allow entries should come before deny entries in case both of them would match. For example, the following configuration will only allow the 1.2.3.4 IP to access your website. The Access screen allows you to manage the users&apos; access on your project. You can invite new users to a specific environment by clicking the Add button and entering their email address, or modify permissions of existing users by clicking the Edit link when hovering the user. Currently, permission changes that grant or revoke SSH access to an environment take effect only after the next time that environment is deployed. Selecting a user will allow you to either edit or remove access to that environment. You can also manage access to users on multiple environments using the project configuration screen. 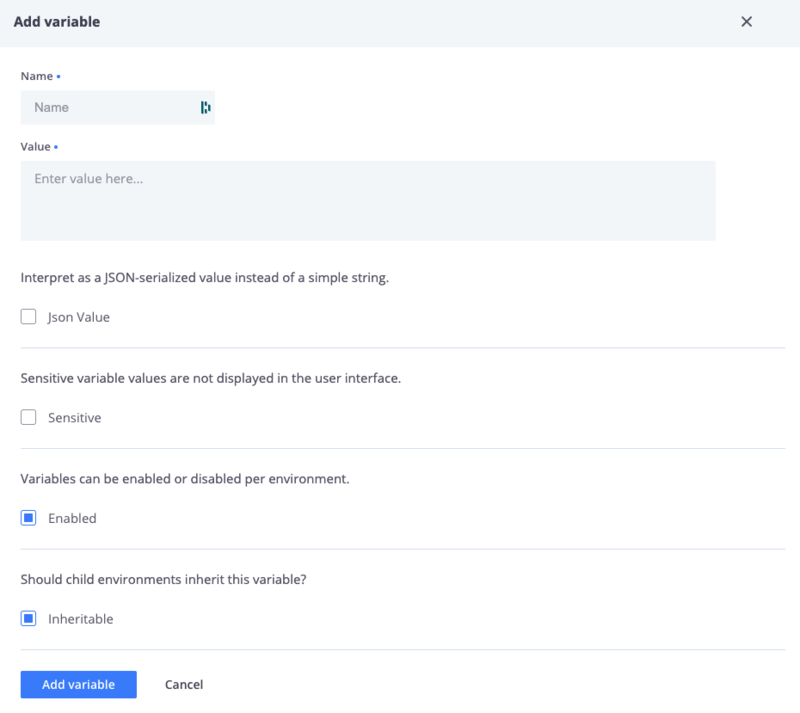 The Variables screen allows you to define the variables that will be available on a specific environment. The Routes screen describes the configuration features that define the routes of your application. Routes cannot be edited here, but it provides a simple routes configuration example for your project&apos;s .platform/routes.yaml file. Consult the documentation for more information about properly configuring Routes for your project.